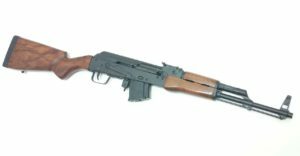 The Hunter is an AK47 style 7.62×39mm sporter rifle manufactured by Lee Armory. The Hunter is built with BRAND NEW Romanian Military Parts From the Famous ROMARM Factory in Cugir, Romania! It has a cold hammer forged chrome lined barrel and a BRAND NEW Lee Armory Monte Carlo Buttstock (MADE IN USA). The Lee Armory Hunter is available in California from Cordelia Gun Exchange!